Are you magazine addicted? 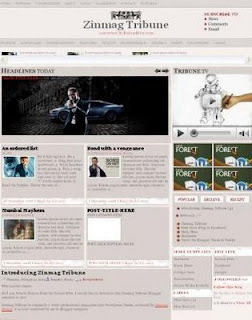 Here's the latest magazine style blogger template, adopted from Wordpress Theme, Zinmag Tribune. Another Jinsona's great design and converted to blogger by Alvaris Falcon. You can check another Zinmag series Zinmag Remedy, Zinmag Primus, Zinmag Forex, Zinmag Futura. More effort to set up magazine style, it's worth for elegant looks. Here's the straight shortcut to original source. Read instruction carefully. whoaaa...!! ini template keren euy..
ngelink dulu ahh..biar kapan2 bisa maen ke sini lagi, hehe..
kapan kapan minta ijin nyuri template-nya ya..